Cathy Patalas, Head of Marketing at Woodpecker, shared her experience marketing Woodpecker, a leading SaaS product for cold emailing automation. 1) What’s the origin story of Woodpecker? Woodpecker was a cure for our pain. We were developing a completely different product at that time – a CRM app for personal fitness trainers. We were a team of four, a bootstrapped startup, with no fancy website or cash for ads. Carefully targeted cold emails allowed us to win our first customers. We needed follow-up automation because follow-ups were bringing us the most replies. We noticed that we had almost three times more replies to the 3rd message in the sequence in comparison to the first email. Our CTO created an email automation program with a minimum interface that only he, Matt (CEO) and I knew how to use – it did not look well (actually I would say it did not look at all), but it worked! A few months later, at the beginning of 2015, we decided to pivot and make the email automation software our main product. That is how Woodpecker was born. Now we have on board almost 2,000 B2B companies (mainly lead generation agencies, consultants and SaaS companies) from 55 countries as our premium customers. 2) What is your role at the company? I started as a blog writer, and now I am Head of Marketing, The Woodpecker blog played a significant role in our marketing strategy from the very beginning. It still does. However, now it is one of the marketing activities we run at Woodpecker. An email newsletter is a vital means we use to reinforce the power of our content. We also promote the product and the blog on social media platforms – mostly on Facebook, LinkedIn, and Twitter – and to some extent by pay-per-click campaigns on Google. I am doing my best to keep up and coordinate all the efforts and keep our marketing consistent with our product at all times. 3) How do marketers send “COLD EMAILS & FOLLOW-UPS automatically from their mailbox” while honoring applicable laws and expectations relating to spam? I would say our cold email & follow-up automation is most often used by sales teams to reach out to potential customers, but marketers can also use it to look for partners at other companies and start relations with influencers. Regardless of its final purpose, though, I have always seen email automation as a powerful tool which works only if you use it wisely and you care about your recipients. The laws regulating the use of business email outreach were all created to protect email recipients from too many emails of poor quality. Reasonable email senders are aware of that, and they always respect their recipients. A well-prepared cold email campaign is not a bunch of self-centered leaflets sent to thousands of random people. Careful targeting combined with personalization based on research is a necessary part of every successful cold email campaign. The analysis of campaigns (source) sent from Woodpecker, in general, confirms that cold email is all about quality. As soon as you adopt this approach, you will not see the anti-spam laws as a concern, but as regulations that make sense. We educate our users and blog readers about the applicable laws related to email outreach, and we develop the product in a way that allows them to create campaigns compliant with the regulations like the CAN-SPAM Act and GDPR. 4) When did Woodpecker hire its first marketing employee? What were that person’s main goals? I would say I was Woodpecker’s first marketing employee. Matt Tarczynski, the CEO at Woodpecker, also has a background in marketing and I have learned a lot from him. My #1 objective was also to keep the blog alive with at least one new blog post a week full of useful insights about cold emails based on experience. One new blog post a week was the goal. After three years, I can tell you that regularity and listen to your audience are key for content marketing that works. Growing a newsletter list in MailChimp was one of the goals, too. I remember my goal was to collect a list of 5K subscribers to the blog, and it did sound very challenging to me at the time, but I got there after about a year and a half. Now we have got almost 8000 blog subscribers on the list, and it is still growing organically every day. I would say we always focused on providing useful content in the first place. SEO and the numbers of visits were not our main focus. They have gained importance with time. In the beginning, we wanted to attract the right people who could benefit from our product. Moreover, we did that by choosing a specific, narrow subject matter to our blog, logically connected to our product, and by providing valuable articles on a regular basis. A Little Big Thing – What Do I Put in My Email Signature? Cold Email Intro, or How Should I Start My Message? What Should Go First: Cold Email Copy or Prospect Base? 5) What are the common customer success patterns you see in customers that convert from free trial to paid? That is a question our customer success team would answer better than I would. We are still learning the patterns. We have noticed that the users who had some previous experience in outbound sales are much more likely to convert from free trial to paid. I think it is because they have already got a system worked out, and Woodpecker is just a reliable tool that fits well into that system. To get to the “aha moment” with Woodpecker, the user needs to have a well-targeted prospect base and a draft of their email messages to set up the first campaign. There’s much work to be done before you are ready to use the tool effectively. That is why on our blog I used to write a lot about how to define an ideal customer profile and how to find prospects, as well as about how to write a message that will get you a reply. Lately, I started also writing about technical issues related to deliverability, for instance: a list of email sending limits, or a deliverability checklist, to attract new users who already know the basics and are now interested in optimizing their outreach process. 6) Woodpecker has marketing aimed at agencies and B2B companies. How do you market to these different audiences? We target companies that already have an outreach process in place. For example, lead generation agencies are the customers who know their work and that are learning a lot by testing and experience. They continuously look for fresh technical insights and inspiration for new campaigns. 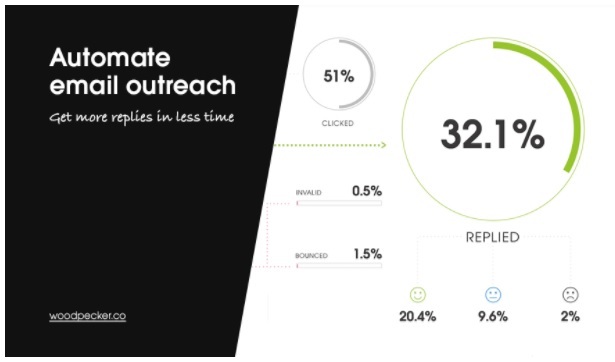 B2B companies which have an outbound sales teams in-house look for practical examples and new ideas on how to make their outreach more effective and efficient. I believe that as long as we focus on the practical side of the outreach process – as long as we tell people how things can be done in practice, how some mechanisms work in the email industry, and why – we attract the right potential customers. 7) What marketing strategies is Woodpecker focusing on in 2018? Content marketing is bringing us a lion share of our leads in general. The blog is the center of all our marketing activities. We promote our service using Google AdWords and Facebook Ads, but that is something we need to optimize yet. Cold emailing is something our business growth team is using to start relations with new potential customers, but they have also been emailing people who might be interested in our content, e.g., webinars we started running lately. We try to contribute to Quora as well, as that is where people look for answers to specific questions. We look for threads connected to cold emailing, lead generation, sales automation, and we try to provide answers that provide some additional value to the present discussion. Facebook, Twitter, and LinkedIn presence is something that mostly helps us promote the blog content. We are also developing the Partner Program to establish a network of people who found Woodpecker valuable and are eager to recommend the product further. 8) Take us inside the Woodpecker blog. How do you pick and choose topics to blog about? First of all, we keep listening to our present users and blog readers to discover what topics they would be most interested in. The blog is to attract new customers, but it is also to help the companies who already use Woodpecker. Usually, the posts inspired by questions from the users are the most popular ones and gain the most positive feedback. On top of all that, they also attract new visitors who struggle with similar problems or look answers for the same questions. Quora has been an inspiration for us as well. We look for questions about emailing that need answers, and we try to provide those answers on our blog. SEO analysis is not our primary source of topics. I treat it only as a set of guidelines on how to name things in our blog posts. 9) How does Woodpecker use outside consultants or agencies for marketing? What was the greatest win you have gained through leveraging an outside consultant? We work with two agencies who help us handle the pay-per-click ads. I think the most valuable part of this cooperation is that they possess up-to-date information about how the online advertising platforms work, plus experience in how to test and optimize the ads to get the best possible results. I think that you can become an expert in a limited number of fields. There’s so much you can do in marketing right now, but it does not mean you have to do everything on your own, especially if you have a small marketing team, as I do. That is when finding a consultant or hiring an agency can bring you much value. 10) What SaaS companies do you think are doing excellent marketing and why? I admire content marketing of some other SaaS companies, and I am inspired by them – even if their software solves an entirely different problem than ours – because a standard business model provides a context to their blog posts, that is relevant to me. Great examples of those are the blogs of the two helpdesk tools: Help Scout and Groove HQ. I enjoy them because they are practical and they have this unique personal touch to their content. I also admire the Baremetrics blog and the way they share their stories. Moreover, I love MailChimp for their light tone, yet a very professional approach and coherence of their brand. 11) What are your favorite places online to connect with others in the SaaS industry? I sometimes look for inspiration in the GrowthHackers community, because lots of great content is shared there. I like the Startup Chat podcast with Steli Efti and Hiten Shah because they talk about marketing and sales issues from two different perspectives and share their experience in SaaS business. 12) What marketing metrics are most useful for your business and why? My primary marketing KPI is the number of free trial signups, but that is not all, apparently. I also get updated by our sales team about the number of free trial users that turned out to be qualified leads and sales opportunities, then we analyze how many of them became paying customers, and for how long. In SaaS, you have to remember that it is not just about getting a lead that you can turn into a one-time customer. You look for people who are going to be your clients for months and years. That is why we are always analyzing our client base, we keep updating our ideal customer profile, and keep adjusting our content strategy to this profile. 13) What are your favorite marketing books and podcasts? The book that changed my view on marketing was Crossing the Chasm by Geoffrey A. Moore. This book shows why it is crucial to focus on the right type of potential customers and keep all the company activities, not only the marketing ones, client-centric. An advocate of a similar approach is also Lincoln Murphy – I highly recommend his blog at sixteenventures.com, it is a must-read if you work in SaaS business. I would also mention Startup Chat podcast by Steli and Hiten. 14) For readers who want to connect with you and Woodpecker, where should they go? Please visit our blog at blog.woodpecker.co; you are more than welcome to leave a comment there under a post that will be interesting to you. Come to our product website to learn more about our email automation solution. You can find me on LinkedIn or Twitter as well and reach out if you have some questions.